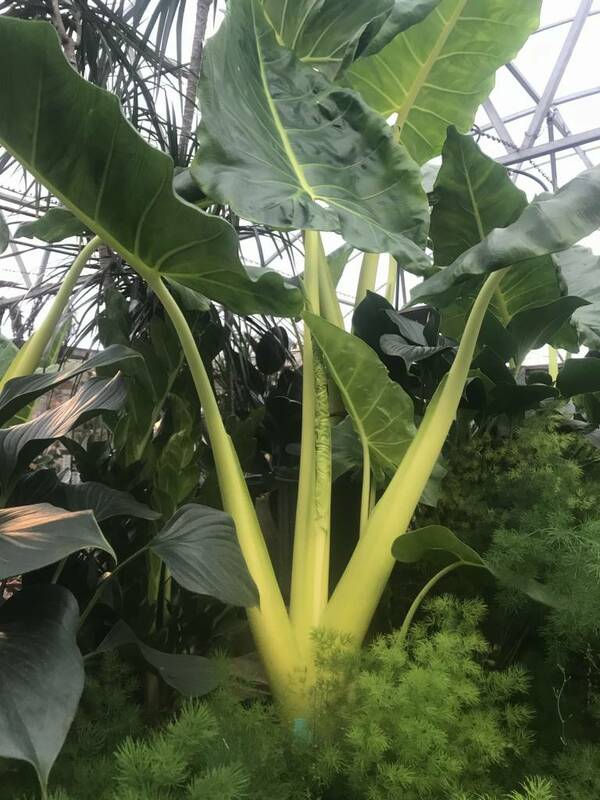 It’s Spring In The Greenhouse! 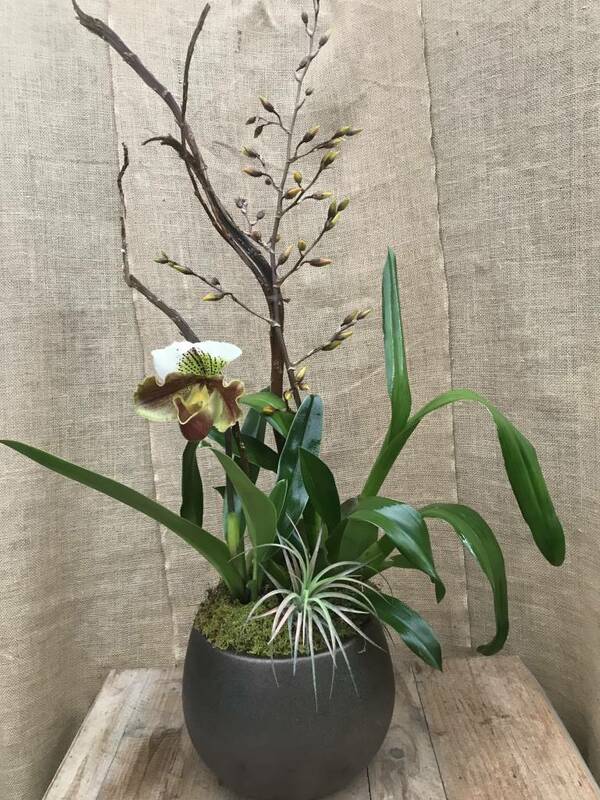 This entry was posted in Flowers, Indoor Plants, January, Orchids, Tropicals and tagged greenhouse color on January 28, 2018 by Kris Blevons. 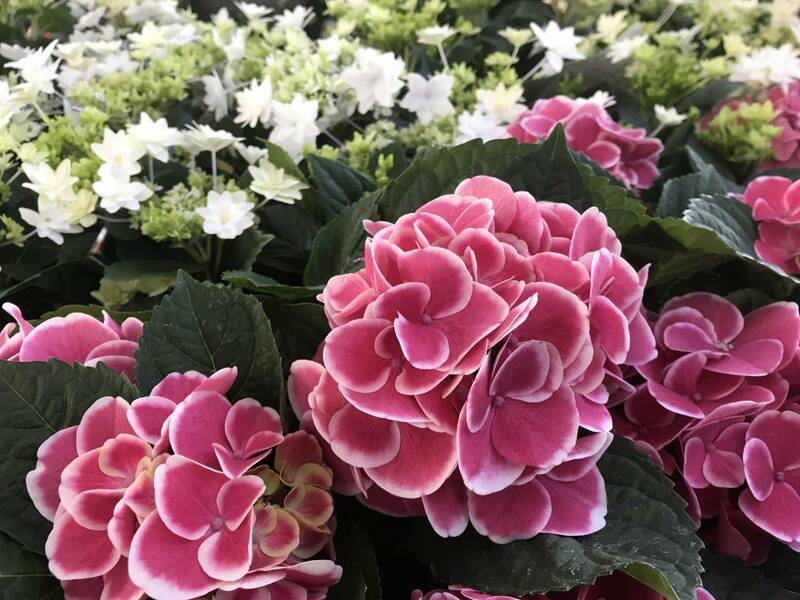 May and June are prime months for tropical plants to enter the garden picture, as temperatures during the day (and night) are finally warm enough for these tender flowering beauties. The most common and widely grown is a native of South Africa, Plumbago auriculata, a shrubby white or blue bloomer that’s typically used in container plantings in sun to part sun. 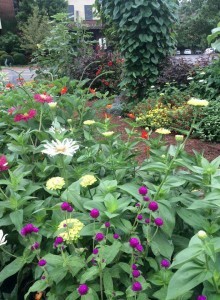 If you haven’t tried it and prefer either color in your garden or planters, it’s a lovely and tough addition. An occasional light clip and fertilizer to keep new growth and buds coming are all it requires. 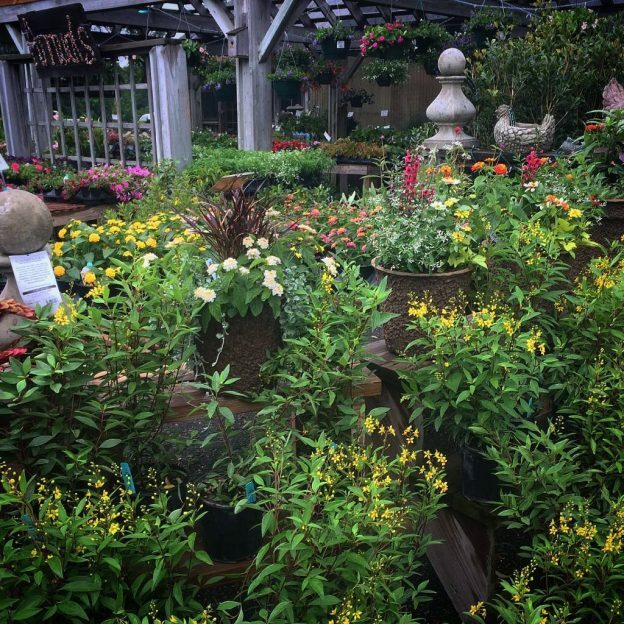 Another of my favorites of the last few years in container plantings, and pictured here, is Thryallis, Galphimia glauca, a floriferous yellow tropical that also blooms through the summer and is quite carefree. 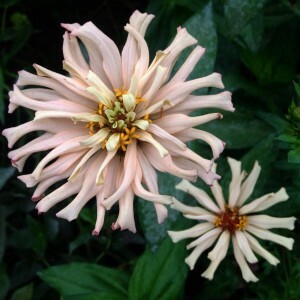 A native of tropical areas extending from Mexico to Guatemala in Central America, it likes it hot and soil that’s not soggy but well drained; take care to not overwater. 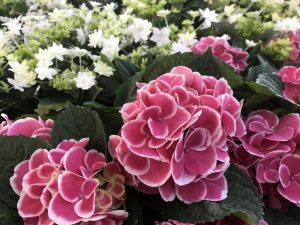 Since it will get quite robust by the end of the season, place it in a large container or bed and let it go. 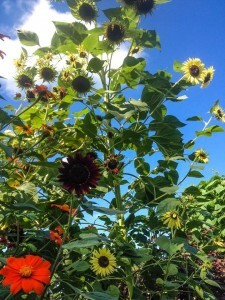 It will be at its best in full, hot sun, ideally in a spot that’s protected from a lot of wind. Finally some good news for any of you that deal with deer issues – they don’t like it and won’t touch it (Though we won’t make any promises!). 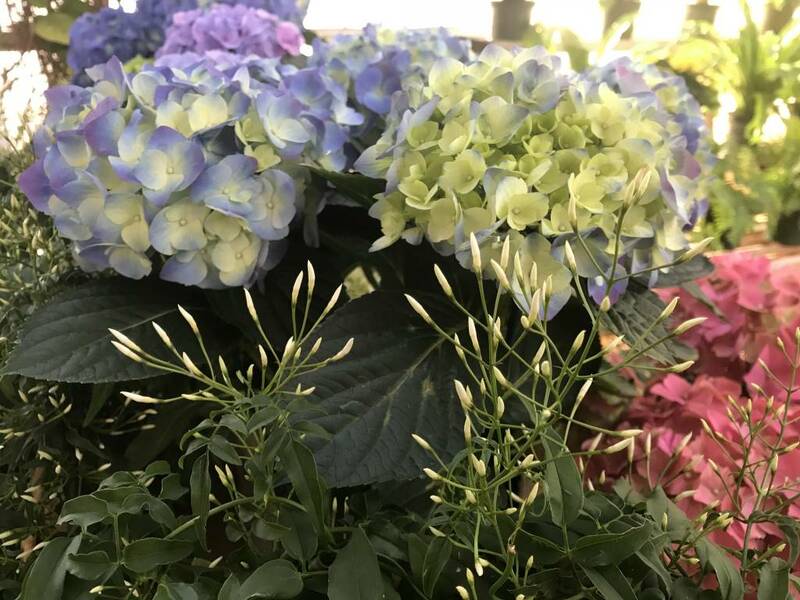 We have plumbago and thryallis in stock now if you’d like either of these tropical beauties to brighten your summer garden. They won’t disappoint! 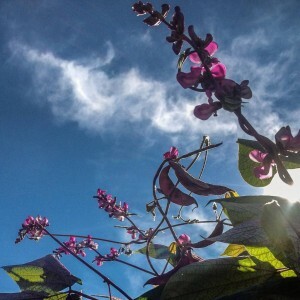 This entry was posted in Tropicals and tagged plumbago, thryallis, tough tropical plants on May 10, 2017 by Kris Blevons. 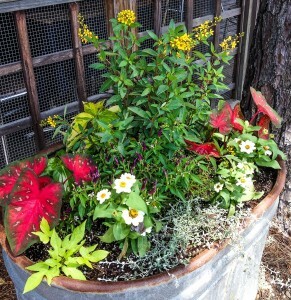 The three horse troughs that are planted each year at Dyron’s restaurant next door finally got their summer makeover the other day. Last year’s troughs were planted with a variety of herbs and annuals, and you can see them if you click on the link above. 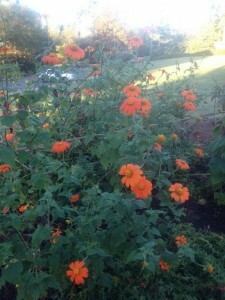 This year’s planting utilizes the tropical shrub, thryallis. 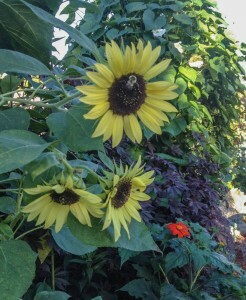 It’s bright yellow flowers provide continuous color through our summer heat and will show off well in this spot. 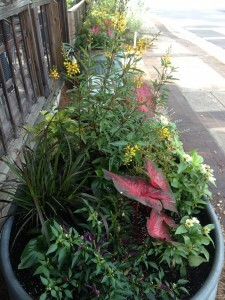 These planters get very hot afternoon sun, and I’ve found that brighter colors really work best here. 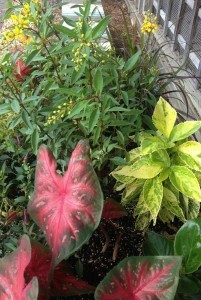 While all caladiums appreciate heat and shade, there are some that can also handle sun, including ‘Red Flash’, the one shown here. 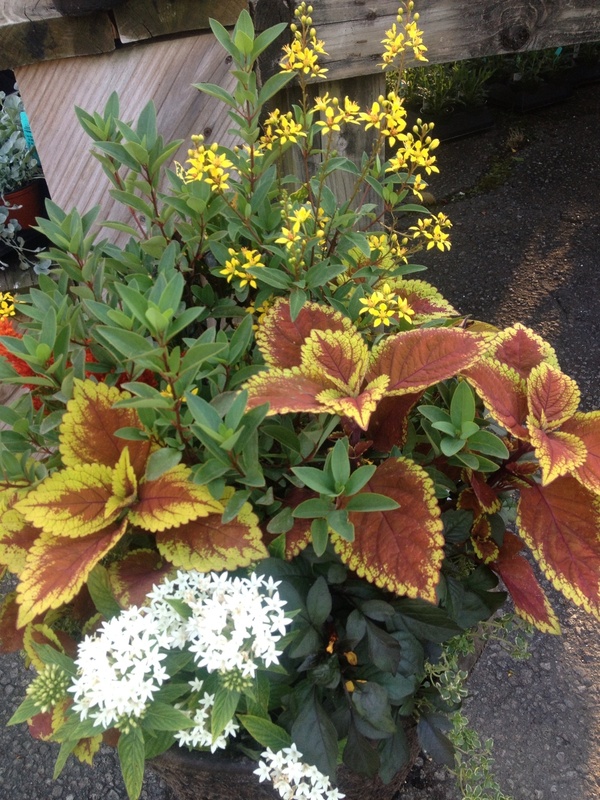 These deep red leaves will mingle with the other foliage and flowers, including a copper plant, Acalypha ‘Tahitian Gold’. It was chosen for its yellow foliage to echo the yellow blooms of the thryallis. The acalypha and a red fountain grass will grow up tall, providing a nice backdrop to this composition. Next up, some zinnias – the Profusion series perform beautifully in our heat and humidity and add white blooms with yellow centers all season. A tiny leaved coleus, Ruby Gold, will fill in the center. 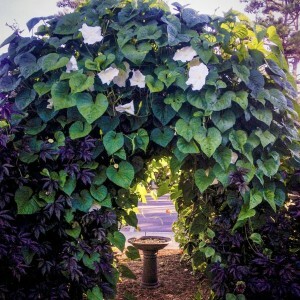 Finally, to trail, some potato vine, a chartreuse-leaved variety in the Sweet Georgia series. These are not quite as rambunctious as the old standby, ‘Margarite’. Last, a silver trailing plant. 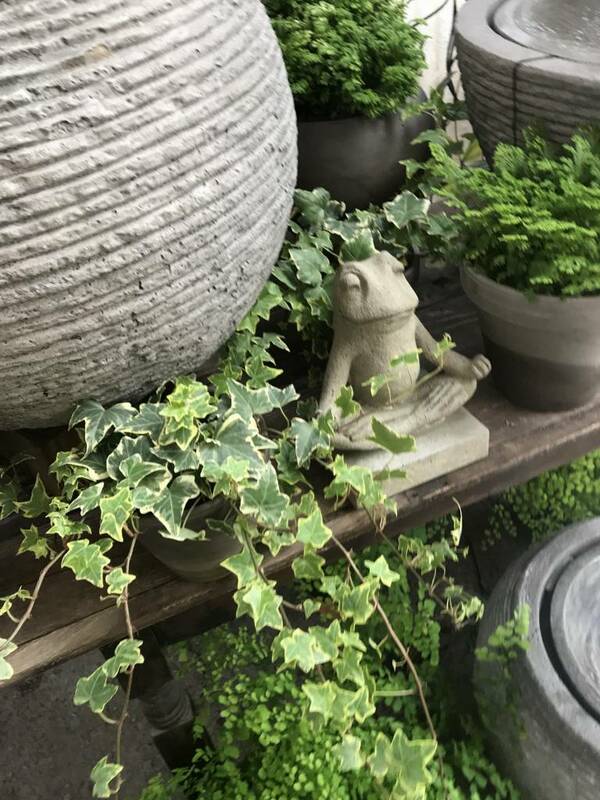 Usually I use silver dichondra for this color because it holds up extremely well in our heat and humidity where so many other silver plants fail. This year, though, I’ve decided to try a new plant…a selection of one that I haven’t had good luck with, but this is supposed to be an improved variety, so we’ll see. 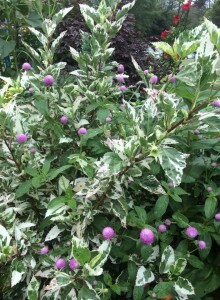 It’s a licorice vine, Helichrysum ‘Silver Star’. We’ll keep an eye on this one and hope for the best. 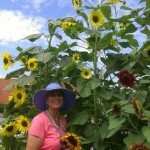 It scored high marks in the University of Georgia Athens trial gardens, so I have high hopes! 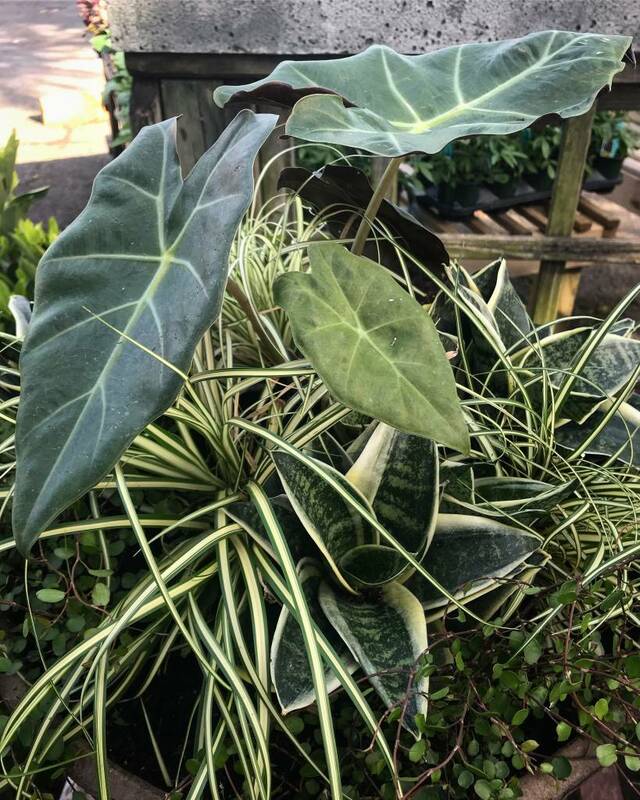 Maintenance, as always, will involve consistent watering, as well as grooming to remove any yellowing leaves and caladium seed pods. 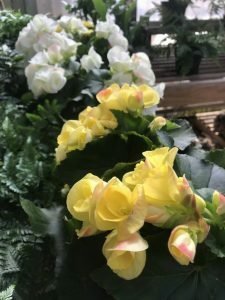 I’ll also be clipping back the ‘Dragonwing’ begonias to keep them in bounds, deadheading and clipping the zinnias, and cutting back the acalypha if it grows out of proportion. 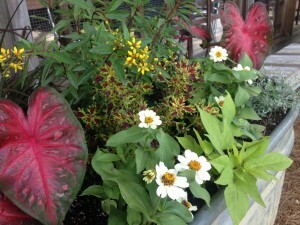 Correct maintenance is the most important aspect of keeping container gardens beautiful! 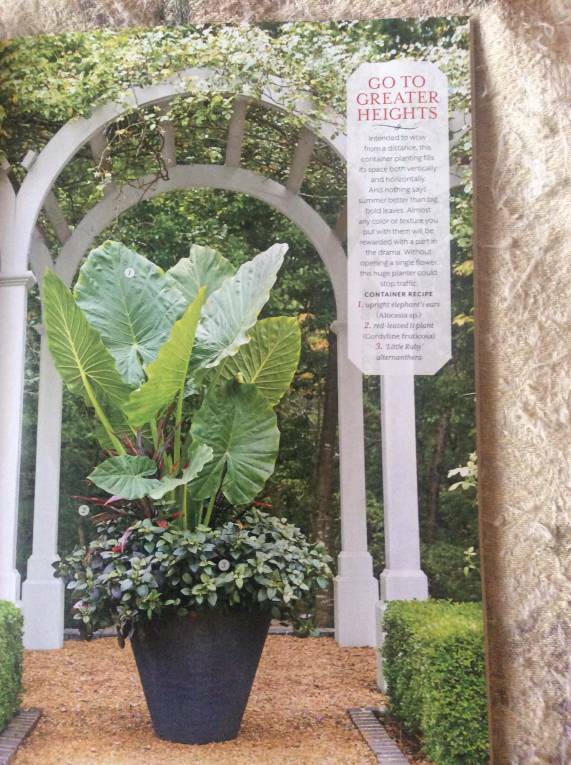 This entry was posted in Annuals, Container, Flowers, Planting Tips, Tropicals and tagged acalypha, caladiums for sun, containers with tropicals, copper plant, dyron's restaurant planters, licorice plant, thryallis on May 26, 2014 by Kris Blevons. There are many unusual varieties of staghorn ferns, but the most common, and the one you’ll see most often, is Platycerium bifurcatum. be remounted on a larger piece, as it will become quite heavy. Staghorn ferns in their natural habitat grow in trees as epiphytes, getting their nutrients from tropical rains that wash nutrients onto their growing base. They’re native to the Philippines, Southeast Asia, Indonesia, Northern Australia, and Africa…and there’s one rare species in South America. An unusual looking fern, they actually have two quite different types of leaves. The first is the basal leaf that doesn’t look much like a leaf; it’s the part of the plant that grows onto the branch or piece of wood that they’re commonly mounted on. 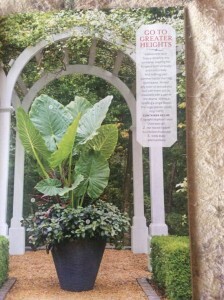 The second is the fertile foliar leaf, the one that looks like a staghorn, and, of course, is where the name comes from. 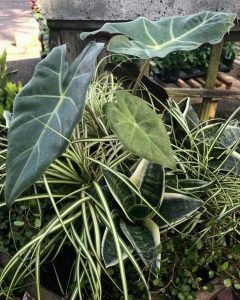 Both types of leaves are covered with hairs that help conserve moisture and give them their silvery cast. Because stagorn ferns can grow quite large, they are usually grown attached to wooden planks using sphagnum moss as a base for the basal leaves to attach themselves to. 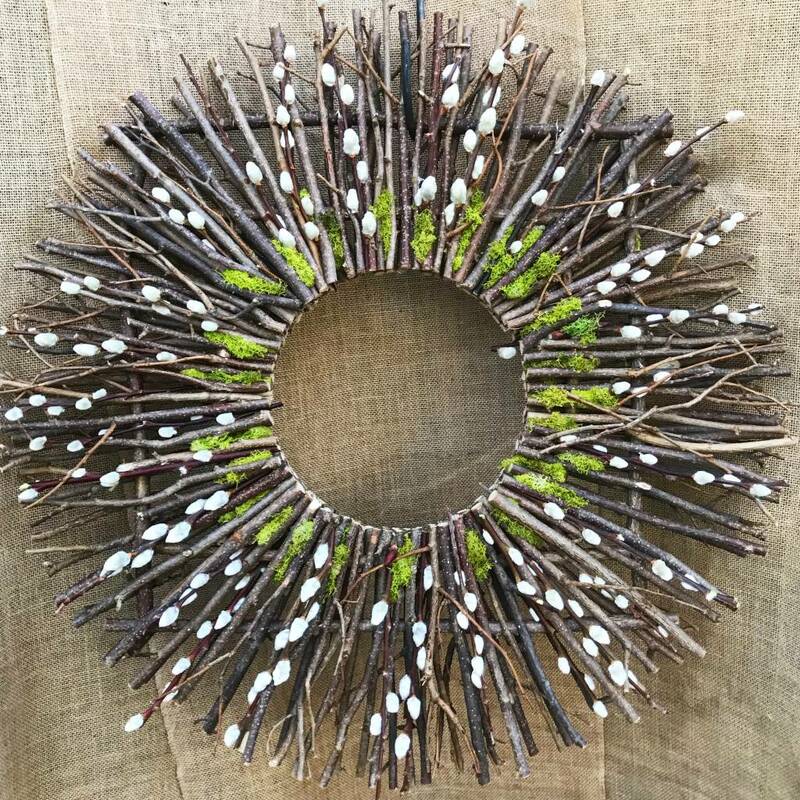 They can also be placed in wire baskets, also using sphagnum, and this method allows the new leaves, or pups, to grow through the basket, eventually growing into a ball. Quite the conversation piece! A customer, who grew up in Florida, told me she remembers growing them in strawberry jars – as they got larger, the fern would slowly encompass the jar…we’re going to try this! 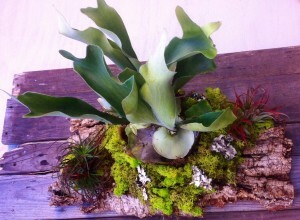 Caring for your staghorn fern is quite easy. 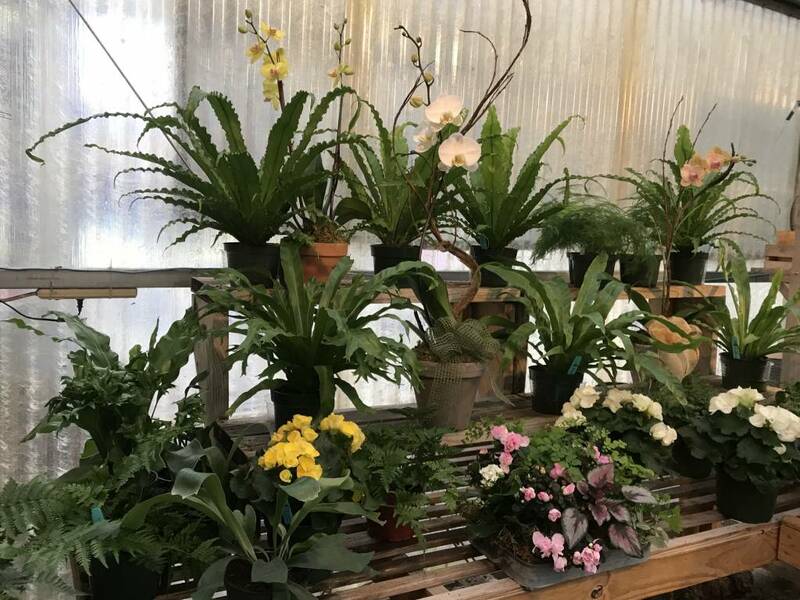 The most important thing to remember is not to overwater; allow your staghorn fern to go completely dry between watering. 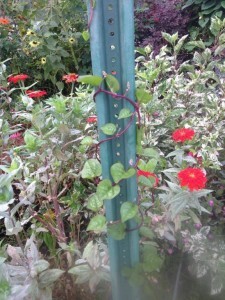 If you’re not sure whether to water, leave it alone until the leaves slightly wilt. An overwatered fern will suffer and possibly die, where one that’s allowed to dry completely will quickly recover once watered well. 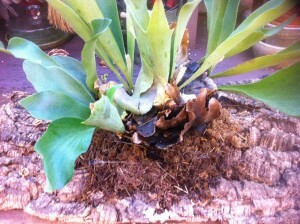 If a staghorn fern has been overwatered it may develop a fungus appearing as black spots on fronds, which can spread rapidly and kill the plant. Older plants, with many layers of spongy old shield fronds will be able to go drier than younger plants. Fertilize with a 20-20-20 fertilizer once a month from spring through summer and every other month from fall through winter. 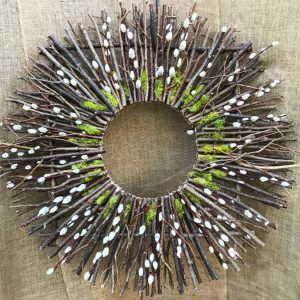 Generally pest free, mealy bugs and scale can be problems, and may appear during winter months when the air is drier and the plant may be more stressed. 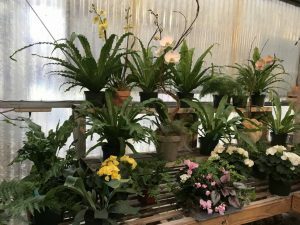 A bright room indoors is ideal, and, through the summer, place your staghorn fern outside under a shade tree or on a sheltered porch where they can enjoy the extra humidity outdoors. 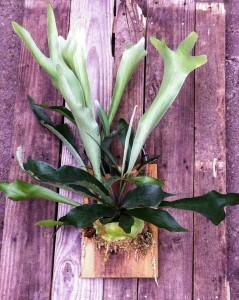 Eventually, if it’s happy, your staghorn fern will grow to a very large size. They can be very impressive! This entry was posted in Ferns, Indoor Plants, Planting Tips, Tropicals and tagged care for staghorn ferns, staghorn fern on February 15, 2014 by Kris Blevons. 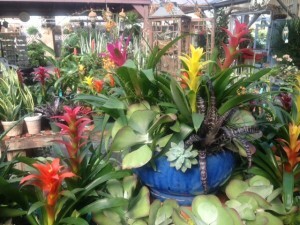 You’re no doubt familiar with the brightly colored bracts and strap-like leaves of bromeliads. Extremely long lasting and colorful alternatives to orchids and other flowers, they can’t be beat for a touch of tropical beauty and their ease of care in our homes and offices. 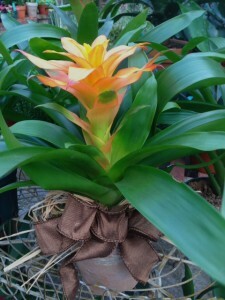 These bright plants are distinguished by their rosettes of leaves – the most famous of the bromeliads is the pineapple. 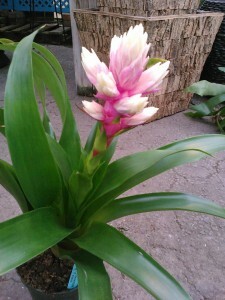 Bromeliads can be found growing in the wild from Florida and the West Indies to Mexico, through Central and South America. 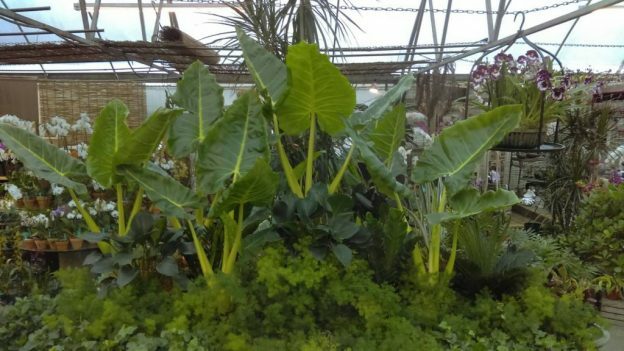 They’ve adapted to a wide range of growing conditions, though, from tropical rainforests to elevations as high as 11,500 feet in the Andes Mountains. The majority of bromeliads are epiphytic, meaning they grow on trees but don’t take nutrients from the tree itself, rather from the moisture in the air – the tree is just a means of support. Another member of the bromeliad family we carry is cryptanthus. It is a terrestrial, growing on barren, rocky soil. Cryptanthus are found in the cloud forests of Ecuador, surviving on the moisture from the clouds that envelope them. The dark leaved and silver/gray bromeliad-like plant we’ve had all summer is a cryptanthus called ‘Black Mystic’, and it is beautiful and easy to grow! 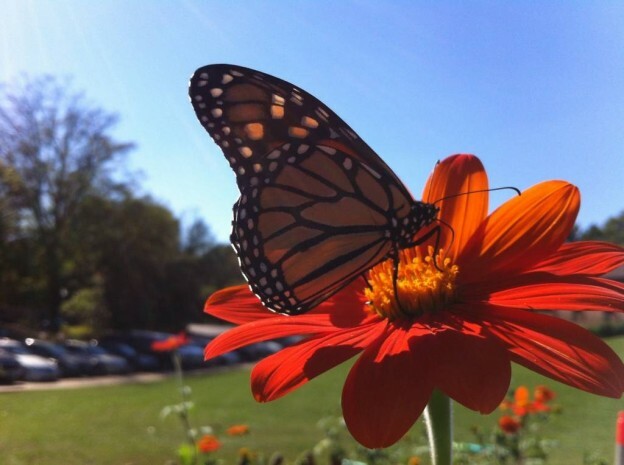 It’s fascinating to find out the native habitat of many of the plants we use in our homes and offices – but understanding where these plants come from originally can also help us better understand how to take care of them. 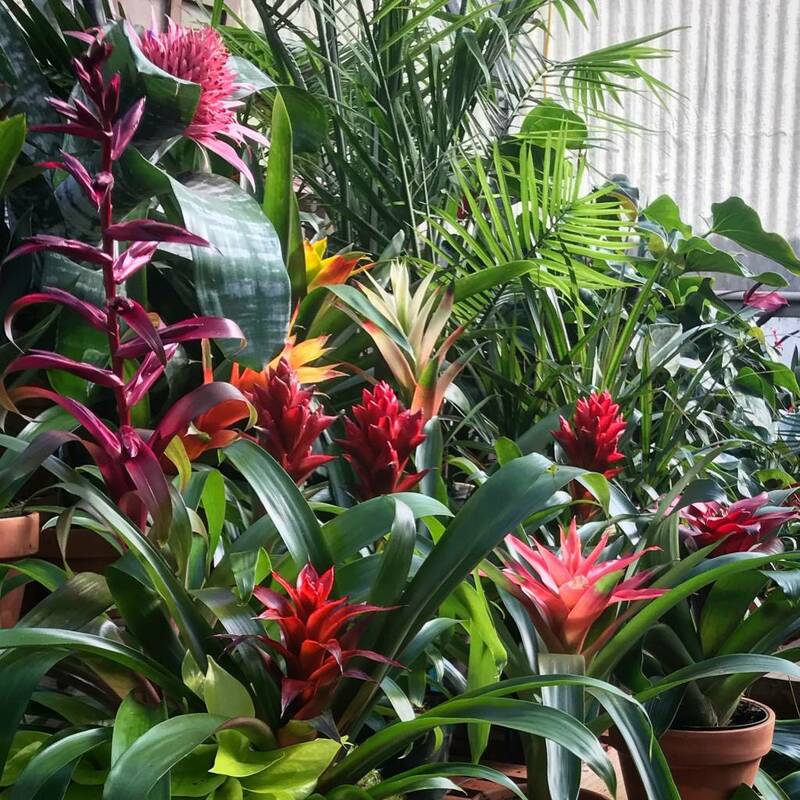 We hose down our bromeliads in the greenhouse when they’re very dry… if you’d like to more closely mimic the natural conditions of the bromeliad in your home (minus the hose! ), let tap water sit for a few days so the chlorine and fluorine dissipate. 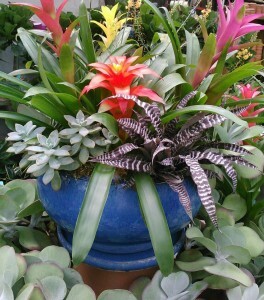 Pour into the “cup” of the bromeliad and freshen the water periodically, allowing the water to flow over the cup and into the soil. 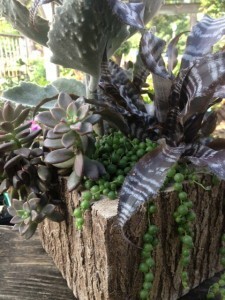 Now that you understand the natural growth of bromeliads, you can see why it’s important not to overwater them. 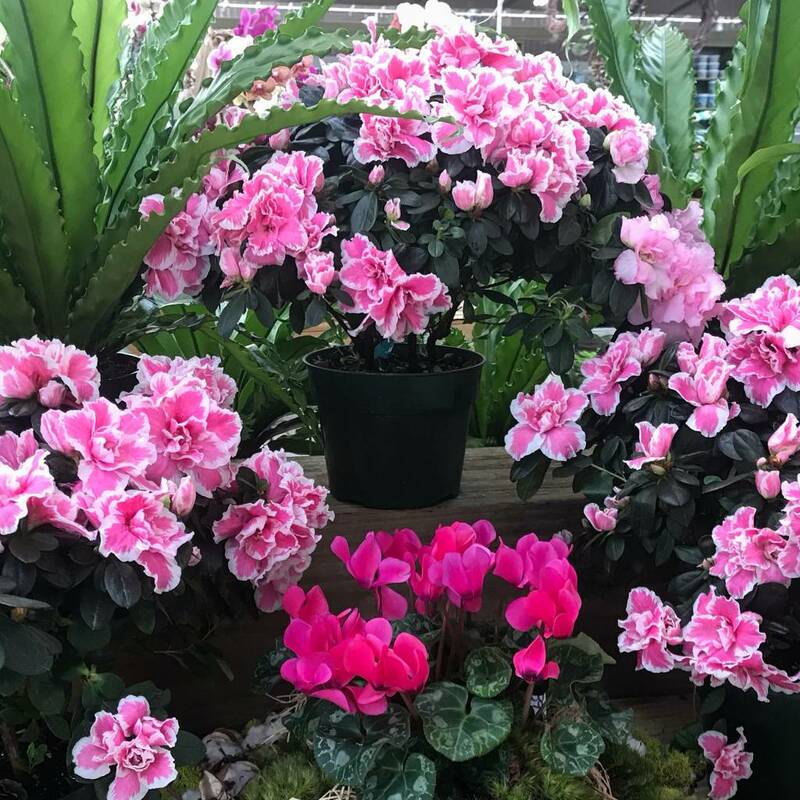 Allow them bright light inside or place them outside on a patio or porch through the summer to enjoy these bright beauties! This entry was posted in House Plants, Indoor landscape, Indoor Plants, Tropicals and tagged bromeliads, cryptanthus, tropical plants on September 3, 2013 by Kris Blevons. 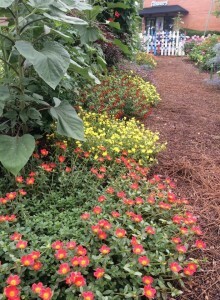 A Look At The Nursery – Come See! 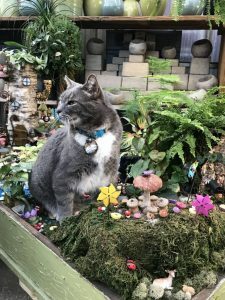 We’re at the beginning of the new planting season and thought it would be nice to give you a glimpse of the nursery…for those of you familiar with us, you know things come in and go out just as fast – if you see something you think you could use, it’s really best to make up your mind quickly! Of course, we’re always happy to take your name and number and call you if we’re out of something that can be reordered. 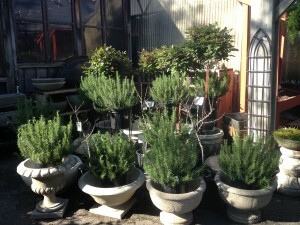 The rosemary has been beautiful – this is one herb that does so well for us here in the Birmingham area…it’s happy in the ground and in containers. 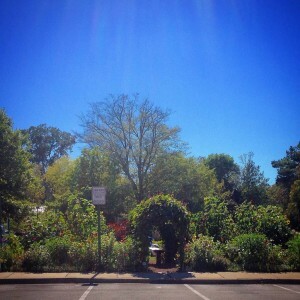 It’s just a big, beautiful, edible shrub! 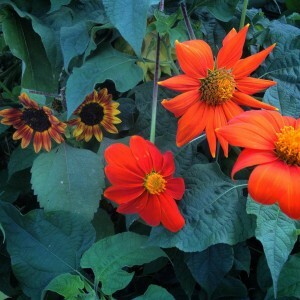 Plant it in full to at least half day of sun and give it excellent drainage and you’ll have a winner on your hands. 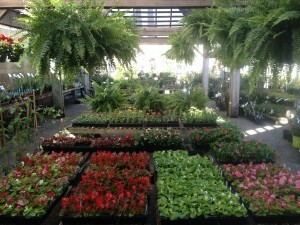 We’re beginning to get serious about stocking bedding plants. 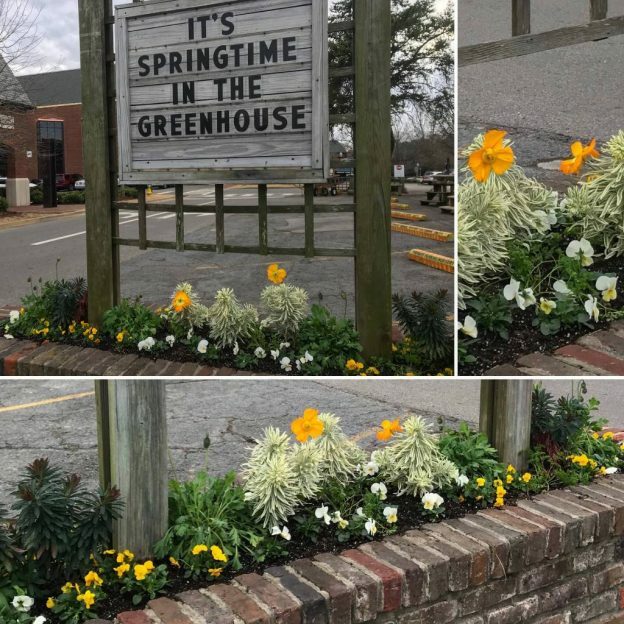 While our last average frost date here is mid-April, we are pretty much there, though many of you are just now seeing the pansies at their peak. 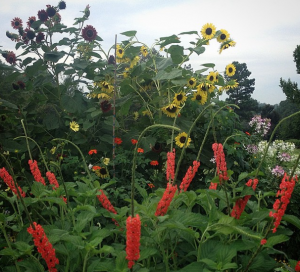 Enjoy them, and when they’ve given out in the heat, replant with your summer bedding plants. Container plantings are usually the first to suffer as a result of higher temperatures, especially if they dry out at all. 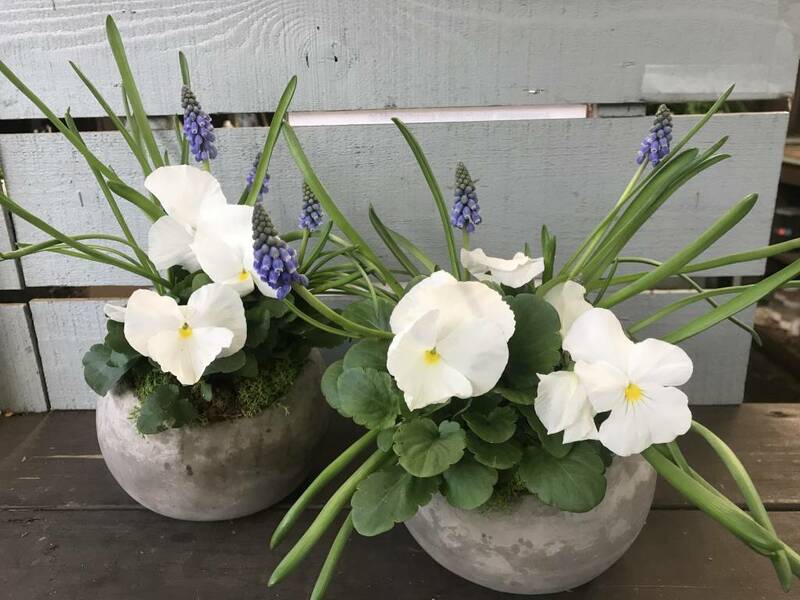 We’re beginning to get in everything you’ll need for pots, hayracks and more…shipments come in just about every day but Monday! 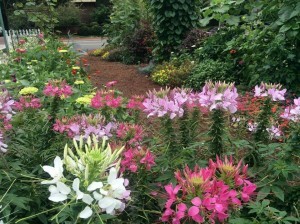 The nursery is divided into distinct areas. All of the shrubs are against the fence on the inside of the lath house and on the end toward the alley. 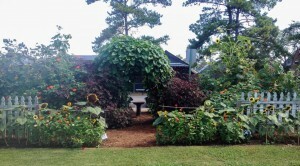 Annuals and tropicals are out front on the tables and steps, and also in the middle area under the lath house on tables. 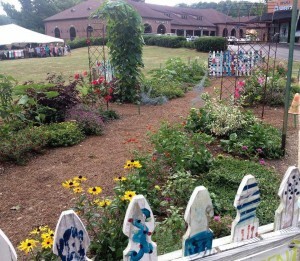 Perennials and groundcovers are against the greenhouse on tables and on the ground. This entry was posted in Annuals, Bedding Plants, Groundcover, Herbs, Perennials, Spring, Summer, Tree/Shrubs, Tropicals, Uncategorized and tagged bedding plants, containers, nursery, rosemary, spring on April 10, 2013 by Kris Blevons.